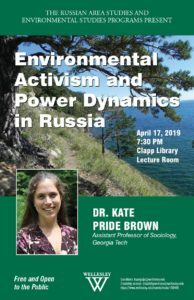 The Russian Area Studies program and the Environmental Studies program present a lecture by Kate Pride Brown, sociologist and assistant professor of sociology at Georgia Tech. Dr. Brown’s recent book, Saving the Sacred Sea: The Power of Civil Society in an Age of Authoritarianism and Globalization, explores how civil society in Russia has dealt with power on a global stage while under Russia’s authoritarian regime. 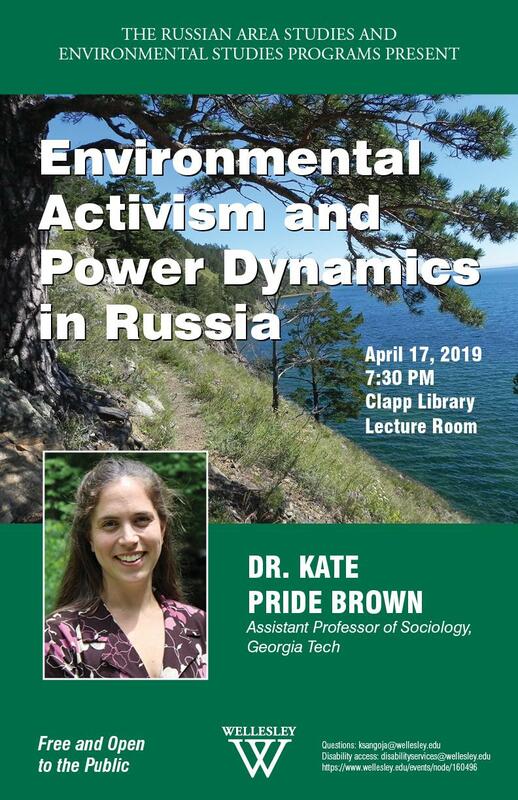 Her talk, focusing mainly on environmental groups in the Lake Baikal region of Siberia, will describe their genesis and development while also probing the power dynamics that unfold when capitalist corporations form partnerships with environmental groups in Russia and beyond. 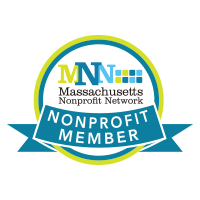 Generously supported by the Kathryn Wasserman Davis ’28 Fund.